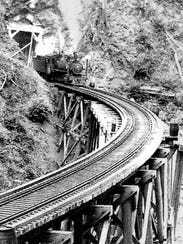 Steel rails hang in the air above the raging Salmonberry River. Floods damaged this railroad line northeast of Tillamook beyond repair, but the historic track may live again as Oregon’s next spectacular rails-to-trails conversion project. Already hikers can follow the historic line 4.8 miles upriver, over abandoned trestles and steel bridges, to a water tank where steam locomotives once stocked up before tackling the Coast Range grade.